It is always a struggle to get your kids to hang their coats in its respective spot when they come from outside. A great way to encourage that and make it an activity they look forward to is by getting a personalized coat rack with their names on it. Just like many of our other products, this kid’s coat rack combines fun and functionality into one. 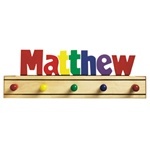 Made with 3-D letters that are bright and colorful and pegs to match them, this solid maple wooden coat rack can vary between 16” and 22.5” based on the length of the kid’s name. We use lead-free colors in primary or pastel shades in our personalized coat racks for kids. The number of pegs in these children's coat racks usually range from 3 to 5 but can vary based on the name. If you want to use these wooden wall coat racks in a common area in the house, then choose words like “love,” “family” or go with the family’s last name. Easy to hang, these personalized coat racks for kids are a must-have in every family. Just like our personalized coat racks for kids, we offer a multitude of products that are designed with children in mind. Check out our selection of name storage step stools, KidKraft toy boxes and monogrammed lunch boxes. All of our products are designed and handmade by expert craftsmen who love designing for children. If you have any questions about any of our products, give us a call at 888.320.3080 or email us at customerservice@tinykeepsakes.com. Shopping for the first time with us? Don’t forget to use the promo code “STEP” to get 5% off your first order. Be sure to connect with us on Facebook to learn about our products and any deals we might be offering on them.